Thank You, Good Shepherd Lutheran Church! Thanks to our friends at Good Shepherd Lutheran Church who delivered Hope Tree Shoe Boxes for refugee children made by their congregation, and have been making the shoe boxes for refugee children for many Christmases! They delivered to Redeemer Lutheran Church, Atlanta, who also played a big role in facilitating Hope Tree by providing space for gifts to be sorted, organized and delivered to refugee children and families that LSG works with in Clarkston. Thank you to our friends from Little Helpers, who bought and delivered gifts for all members of 2 refugee families as part of our Hope Tree program, in which volunteers purchase gifts for refugee children in need. This was an especially significant experience for the group, as some members were refugees themselves. 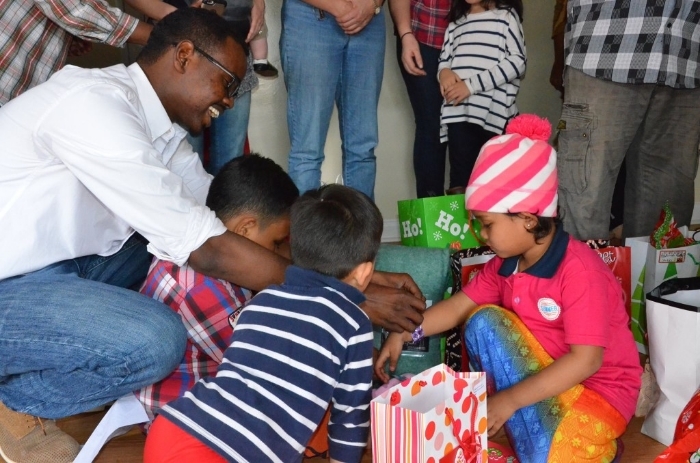 “Our family volunteer group Little Helpers wanted to reach out to people in need this holiday, but participating in the LSG's Hope Tree for Refugees was more fulfilling and important than just that. Some of the volunteers were also refugees who came to this country seeking freedom and finding much support and love. Tears flowed as some of us experienced that "full circle moment" when we were face to face with the families who simply asked for winter clothes and a large pot to cook meals this holiday. Although there was a language barrier, we had no trouble communicating because it was out of respect and love that we were brought together. A big thanks to LSG for allowing us to have this opportunity and for doing such great work to help others achieve their independence." Little Helpers is a program that works with young people to help them understand the value of volunteering, recognize the blessings in their lives, broaden their community perspective and feel the sense of accomplishment received from lending a helping hand. Ultimately, the goal of the program is to raise confident children who incorporate community service into their lives on a regular basis. Little Helpers was created in Memphis, but today has chapters across the country including the Rochester, NY; Mooresville/Charlotte, NC; Denver, CO; Atlanta, GA and Tampa/St. Pete, FL.